Heavy Cold Spring rainbow - eighteen inches!! Watching the fishing and weather reports told me that early May was a good time to fish the lower elevation trout reservoirs. 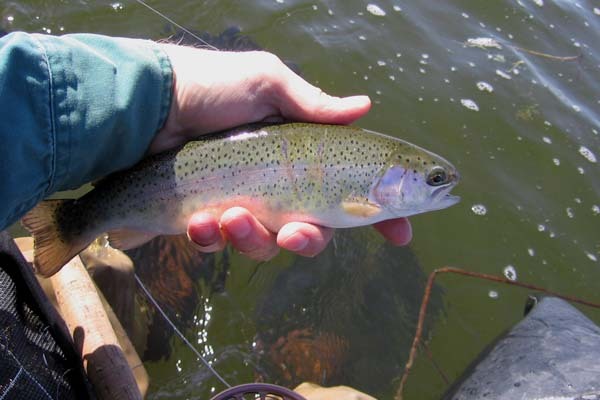 The lowest elevation at which lakes can hold trout year-round is about 5,000 feet. 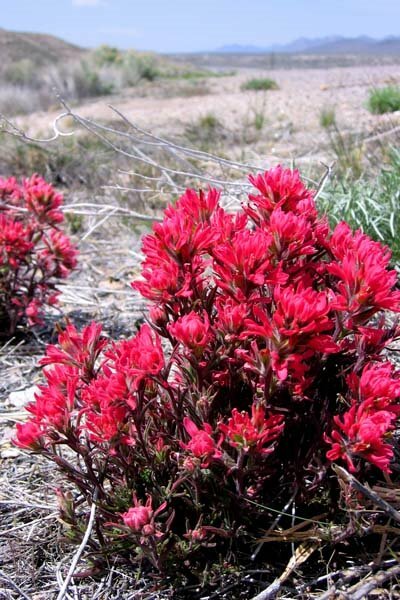 For example, Baker Reservoir (Washington County, Utah) is about 4,900 feet, Wayne Kirch (Nye County, Nevada) is about 5,100 feet, and Cold Creek (Clark County, NV) is about 5,800 feet. 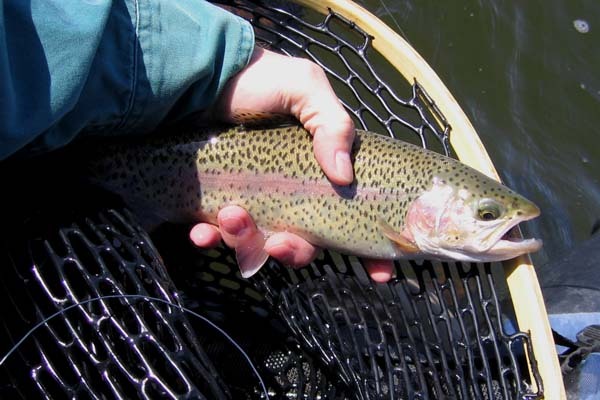 Trout become pretty lethargic when the water temperature in these lower reservoirs reaches 70 degrees Fahrenheit, so spring and fall are the best times to fish them. Summer is too hot, and the reservoirs are high enough to freeze over in the winter. And so I decided to try Cold Springs once more this spring before the water got warmer. The air temperature at 9:00 am that Thursday was about 50 degrees, but the high reached 60. Being it was mid-week I had the whole reservoir to myself. I caught four fish right away (which is not unusual when you’re the first one fishing for the day), and ended up with a total of 36 hook-ups of which I landed 26 trout. 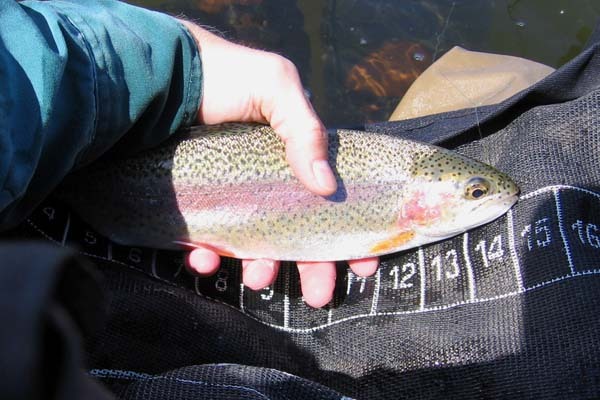 About one-third of the trout were holdovers from previous stockings, and they were beautifully colored. 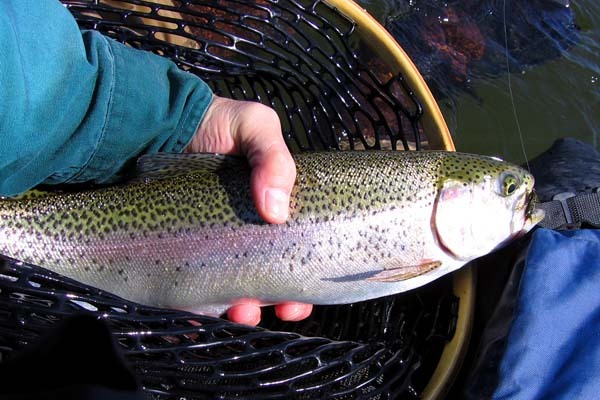 (Holdovers are hatchery-reared trout that survive over one or more winters before being harvested; they tend to look and behave more like wild trout.) The other two-thirds were recently stocked fish in the nine to eleven inch range. 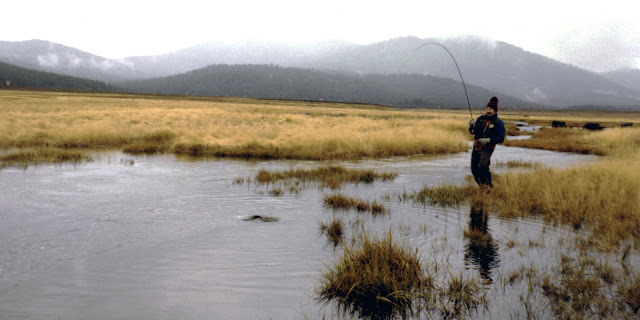 While the holdover trout where usually fourteen inches, I had several in the range of fifteen to sixteen inches with one beauty that was close to eighteen inches. It appeared to be a female that had recently spent her roe as her belly felt loose. She did not jump much, and was released unharmed like all the others. The water was clear. 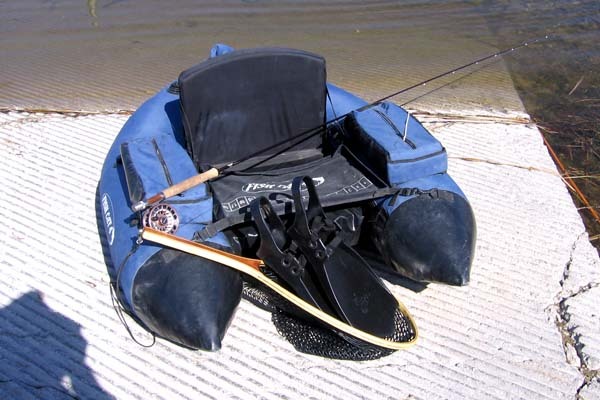 The wind was about ten miles-per-hour when I arrived making the float tube a viable option. It wasn't too difficult to get around out there, but by noon it had calmed down to less than five miles-per-hour which was even more pleasant. Here is a video of my tube bobbing in the wind, and another of my kick-paddling technique that seems to locomote me the best without splashing and signaling my presence to nearby trout. 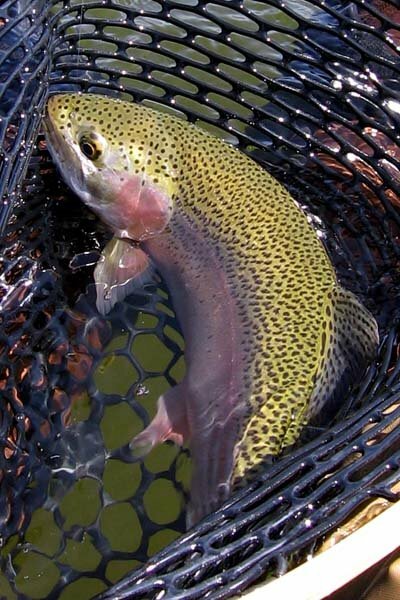 I love catching wild trout, but holdover trout are a good second choice. The Cold Springs holdover trout were beautifully marked and colored. The sixteen inchers really liked to jump, but I must admit the stocked fish were acrobatic as well. 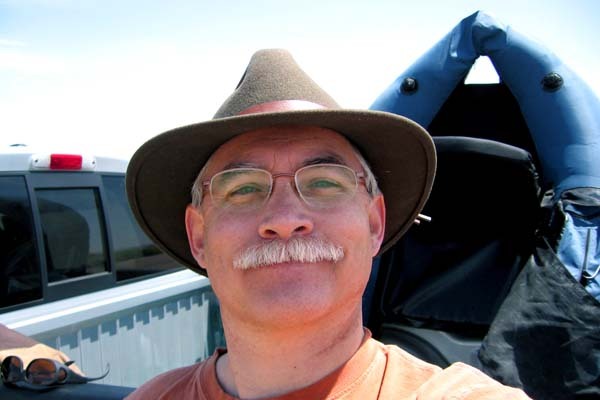 As has been the pattern for Wayne Kich trips, it was a great one-day escape; God surely blessed my late-spring visit to Wayne Kirch.